Netflix mobile app allows you to free download some Netflix movies and TV shows for offline playback on your mobile devices. Yet, what you have downloaded is sometimes unplayable on your iPhone iPad or Android gadgets. Why? That's mainly because of Netflix video codec issues. The current Netflix videos are encoded by H264, H265, H263, VP9 and VC-1. Generally, your handheld devices can successfully play Netflix movies or TV shows if your Netflix files are encoded by H264 or H265 (only for latest flagship devices). Or, most your mobile phones or tablets would fail to play Netflix files thereon if they're encoded by VP9 or VC-1. - MacX Video Converter Pro meets all your expectations. 1. Bulk convert Netflix to MP4, MOV, H264, H265, 4K MP4, MPEG-4, AVI, MKV, FLV, WMV, etc. from any codec/format to 180+ video & 14+ audio formats. 2. 350+ mobile profiles to convert Netflix to iPhone X/8 Plus/8/7/6s/6/Plus, iPads, Android (Samsung, Sony, Huawei, Nokia), Microsoft, PS4, Xbox One. 3. Netflix video editor: trim to freely set Start/End time, crop Netflix video borders, add subtitles to Netflix file and adjust Netflix resolution, frame rate. 4. Free download Hollywood/Bollywood movies and TV shows from YouTube, crackle, bliptv, PopcornFlix, etc. 300+ sites if non-downloadable on Netflix. 5. Record onscreen Netflix movies or TV shows or non-downloadable videos in 1080p or 4K Ultra HD resolution for playback on iPhone iPad Android. Run it after you free download this Netflix to MP4 converter on Mac or Windows. Click "Videos" to import your downloaded Netflix movies or TV shows. Batch conversion is supported so that you can add several Netflix movies for conversion at one stroke. 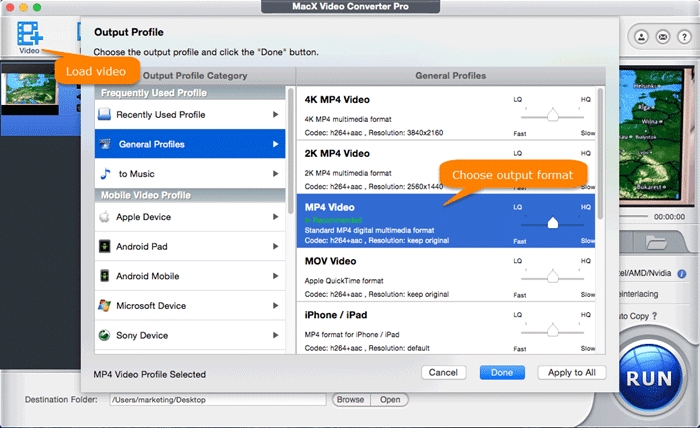 Select MP4 Video (H264) from "General Profiles" as output format, since MP4 (H264) can be widely supported by almost any device, player and platform, no incompatibility trouble. Besides, you can also choose "4K MP4" or "2K MP4" if you have higher demand on the output video quality and your device supports up to 4K 2160p resolution. The video quality will be higher and meanwhile the file size will be larger. Well, you may concern a lot about the output video quality loss. 1%, 2% or 10% quality loss after Netflix conversion? No fixed answer. Here you should make concrete analyses of concrete problems. 1. If your Netflix file is encoded by H264 codec and formatted as MKV file. Then, you can convert Netflix from MKV H264 to MP4 H264 with zero quality loss. That's because you can tick "Auto Copy" mode on this Netflix converter to 1:1 copy Netflix data from MKV H264 to MP4 H264 without codec decoding/re-encoding process. 2. Generally, if your Netflix movie is encoded by H265 codec and you convert Netflix from VP9 to H264 or H265 to H264, then the process is involved with decoding/re-encoding process, which will convert Netflix to MP4 (H264) with 2% quality loss. 3. Providing you just edit Netflix video length, remove Netflix video borders, split Netflix TV series to episodes and more without video codec or format change, the output Netflix video file will keep 1:1 original quality, zero quality loss. 4. There stands a fifty-fifty chance that you just need the top Netflix video converter to adjust Netflix parameters via setting icon like lower 4K to 1080p resolution, change frame rate from 240fps to 59.94fps, 60fps to 30fps, turn down video bit rate, etc. These result in quality loss from 10% - 80%. Improve parameters for better quality if needed. 1. On the output profile window, you can move the LQ-HQ slidebar to improve output video quality. 2. Mannually tick "Use High Quality Engine" and "Deinterlacing" to improve output Netflix video quality. Of course, this is at the cost of slowdown your Netflix video conversion speed, to some degree. After all, quality and speed are negatively related. How about video conversion speed? you may wonder the Netflix movie conversion speed is related more to your computer hardware CPU configuration plus RAM or the Netflix video converter software power? Actually, both. When your computer hardware CPU cooperates well with your Netflix converter software, then the conversion speed can be improved to the maximum level. Luckily, this MacX netflix video converter is just the one, working seamlessly with your PC CPU. With multi-core CPU utility and hyper-threading tech supports, it can assign your Netflix to MP4 conversion task up to 8 CPU cores and 16 threads. Plus, it also features Intel QSV hardware acceleration tech to active your PC QSV to work together to accelerate Netflix conversion speed up to 5X faster than any other converter software. Generally, you convert a 105min length Netflix movie to MP4 H264, 2 mins required at most for Intel QSV supported PC. Hit "RUN" button and it will begin to decode Netflix file and re-encode Netflix ot MP4 (H264) at Intel QSV hardware accelerated speed. The output HEVC video will automatically open after the conversion is over. Afterwards, you can eventually transfer the Netflix movies or TV shows to your iPhone X, iPhone 8/7, iPad, Android, Windows 10, macOS High Sierra or smart 4K UHD TV for smooth playback. Free download high quality Netflix video converter to transcode and convert Netflix movies to MP4 H264/H265 with 98% quality reserved. It also provides you with 350+ mobile device profiles to convert Netflix to iPhone iPad Android Microsoft, game console with best resolution and frame rate default settings. Netflix Shows Black Screen When Playing Movies? Quick Fixes!